Khiva is an ancient city in northwestern Uzbekistan, near the Uzbek city of Nukus and the border with Turkmenistan. It lies in the deserts of Central Asia and was settled early in human history thanks to the AmuDarya River, which brings fresh waster from the glaciers of the Hindu Kush Mountains. Legend has it that Khiva was founded by the Biblical Shem, the son of Noah because of a well with excellent water. The large well can still been seen in the center of the city today. Khiva was probably founded in the 900s, and like many other cities in Uzbekistan and Central Asia in general, Khiva was part of the famed Silk Road from China through the Middle East to Europe. Khiva was conquered by Mongols in the 1200s, invaded by Turks in the 1400s, and became part of Russia in the 1800s, lending a multicultural flavor to the city. KhivaThe city of Khiva is divided into two sections, Dishan Kala, the outer town, and Ichan Kala, the inner town. Khiva's outer city, Dishan Kala used to be protected by a wall with eleven gates. Ichan Kala, the inner part of Khiva, was the first site in Uzbekistan to be placed on the World Heritage List, attesting to its great historical importance. Ichan Kala is surrounded by brick walls with foundations from the 10th century and attractive crenellations from the 17th century, making the walls an impressive 30 feet high. In the center of the city square in Khiva stands a large blue tower, which stands as a beautiful icon today but was originally supposed to be a minaret. Why the minaret was not completed remains a mystery to this day, although one story relates that the ruler of Khiva was worried that someone in the minaret would be able to see into his harem and view his wives. KhivaKhiva's historic district contains over fifty monuments for travelers to admire as well as hundreds of traditional houses. Visitors enjoy Djuma Mosque, originally built in the 10th century and rebuilt later using over one hundred ancient wooden columns. Travelers to Khiva also tour the Sheikh Mukhtar-Vali Complex, which is a mausoleum from the 1500s nominated for World Heritage status. 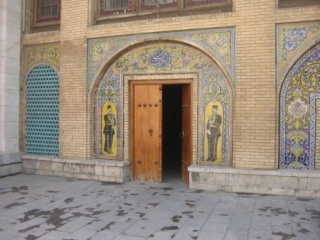 The mausoleum has an ancient form running from east to west with many domes and buildings as well as two mosques, and is especially famous for its beautiful carved wooden doors. 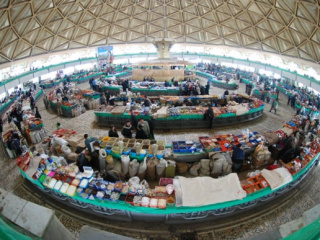 KhivaKhiva is thought of as a turquoise city, while visitors think of Bukhara as brown and Samarkand as blue, and the turquoise comes from tiles around the city. Khiva is one of the best-preserved cities of the Silk Road, with its historic core generally intact, and is a wonderful tour for travelers interested in a glimpse of the fabled history of Central Asia.